Acknowledgement: I am indebted to Alan Lee of The Times for some of the information contained in this guide. By Road: From South: Leave M6 at J21A and join M62 west. Leave M62 at J6 to join M57, follow signs for races. By Rail: Aintree station adjoins the course. Admission: All enclosures: £18. Grand National prices fixed annually. Catering: Somewhat poor food available in the Queen Mother Stand and Princess Royal Stand. Bars lack conviviality except for the crowded gallery looking out from the ancient County Stand. Hotels, Pubs and Restaurants: Aintree is an unattractive suburb of Liverpool but travel north along the coast to Southport where the Royal Clifton has a good restaurant and several pubby bars sell good northern beers. By Road: On the A332 reached via M3 J3 from south and east, M4 J6 from north, M4 J10 and A329 (M) from west. By Rail: Ascot station is 7 minutes walk with regular services from Waterloo, Guildford, Reading. Admission: Premier Admission: £25; General Admission: £15. Catering: Bars sell fair priced drinks and there is a wide range of good quality food on offer , including 3 course picnic baskets at £12.95. By Road: Just outside Ayr, the course can be reached via the A713 from the south, via the A70 from the west or the A77 from the north. By Rail: Ayr station is 1 mile from the course and there is a bus service to the course. Despite the spectacular coastline the general ambience of the course is a little seedy and down at heel. Catering: A club badge gains ntrance to the elegant Western House whee a 3 course meal is £15. By Road: 4 miles south east of Wrexham on A525, then B5069. By Rail: Euston line to Wrexham General then taxi to course. Bangor has a pleasant rural feel and is the only course with no grandstand; grass banks provide natural viewing. £7 ticket holders are able to park on the banks and view from their cars. Car parks can become boggy in wet weather. Catering: Boasts a spacious new restaurant, half given over to waitress served tables and half to a self-service buffet serving hot and cold carvery, cakes, pastries and good coffee. The main food hall offers rolls, burgers and soup and at one end is a cosy sea food bar. A wooden hut for a public bar is a lot better than it looks and creates a pubby feel. Not to be missed is the solitary private box with its own balcony and bar. Hotels, Pubs and Restaurants: Cross Lanes Hotel is a three star establishment in the village and there are also two pubs. 10 miles east at Bickley Moss the Cholmondley Arms provides comfortable accommodation. By Road: 3 miles north-west of bath on A46, reached via M4 J18. By Rail: Paddington or Bristol to Bath; regular buses to course. Admission: Premier Enclosure: £19 (feature days); £17 (non-feature days); Grandstand & Paddock: £15 (feature days); £12 (non-feature days), (OAP's £5 discount in both enclosures). Centre Course £10. Accompanied under 16s Free. The racecourse is rather tatty and faded with a number of ugly buildings thrown together. This may change now it has been acquired by Stan Clarke. Car parking is free and well organised. There is a fairly new stand in Georgian style alongside the original clubhouse. The racecard and public address lack imagination. Avoid the paddock bar and head for the lounge on the first floor of the new stand. Catering: The best plan is to lunch in Bath and then pay £5 for the Silver ring which has a good viewing stand. Plenty of bookmakers and moderate food and drink are available. An uncovered terrace atop the old members stand gives the best view of the races. Hotels, Pubs and Restaurants: There are two 5 star hotels in town, the Bath Spa and the Royal Crescent. Less expensive is the Queensbury in Russel Street and the basement restaurant (the Olive tree)is among the best in Bath. Pubs worthy of mention include the Moody Goose, the Hole in the Wall and 2 miles west of town the excellent Lettonie. Best pub of all is the George at Norton St Philip. By Road: Off A1079, 1 mile west of Beverley or A1 (M) and M62, J38, then via B1230 to Walkington. By Rail: Kings Cross to Beverley (change at Doncaster or Hull)then bus or taxi to racecourse. Admission: Club: £17; Grandstand & Paddock: £12 (OAP's, £7); Course: £4 per person £5 per car (OAP's £3). Children Under 18 free if accompanied by adult. Set on a hillside, Beverley racecourse is somewhat exposed to the elements but with a charming view down to the 7th century minster, where Lewis Caroll, author of Alice In Wonderland, was once a curate. The course from the town is poorly signposted and the car park is rough and uneven. However the smart entrance hall, manned by liveried staff, creates a favourable impression. Racecards at £1 are not glossy but effective and the public address is chatty. 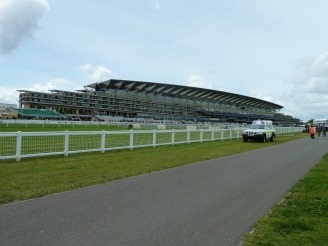 Betting is supplied by bookmakers at either end of the course and the track can be viewed from the steps of the stand. Catering: Well tended flower beds and benches lead to the Paddock Bar which has a first floor balcony overlooking the winners enclosure and a head on view of the straight. The bar is comfortable and the beer is cheap. The buffet food here is good and fresh and a Tattersalls badge gains admission. For those paying £15 entrance fee the members restaurant posts a menu in the entrance lobby and there is a proper fish and chip shop further down the course. Hotels, Pubs and Restaurants: Best pub is the White Horse at Hengate, while the Beverley Arms is a decent hotel in the town centre. Rowley Manor, in Little Weighton is a pleasant place to stay and the Manor House at Walkington has a fine restaurant. By Road: East of town on the A2 - access signs not very clear. By Rail: Brighton station; regular buses to course. Brighton is another once faded course revitalised by Stan Clarke and is now a far cry from the hovel immortalised by Graham Greene in Brighton Rock. There are a number of low-level hospitality suites and Catering outlets. The main stand is bright and well equipped. Catering: the bar staff are attentive and drinks prices reasonable - unusually you can buy champagne by the glass. The main restaurant offers a 3 course meal for £25 while snack bars and a seafood bar provide inexpensive fare. Filtered coffee is available in most areas. The racecard at £1.50 is good value and interviews with trainers in the winning enclosure are broadcast over the public address. There are a large number of TV screens with a giant one in the members bar. Hotels, Pubs and Restaurants: Small hotels abound in town and the Regency Square is better value than its grander neighbours. The Dove offers sea views and personal service or try the Courtlands In The Drive at nearby Hove. The Black Chapati is a fun restaurant or if you prefer French food visit One Penton Place in Kemp town. By Road: 3 miles from M6. By Rail: Carlisle station; regular buses to course. Admission: County Enclosure: £17; Tattersalls: £12; OAP's £8. Accompanied under-16's free. Premier days: County: £20. Tattersalls: £15, OAP's £10. This is a cosy, clubby place where everyone is made to feel welcome. There is both flat and National Hunt racing but it is primarily a jumps course with a daunting 5 furlong climb to the winning post. Catering: The wine and coffee bar next to the the paddock sells homely fare and homemade cakes. The members dining room upstairs provides a decent lunch for £14.50. The place to be is the Lucius bar downstairs serving whiskey and beer, cigars and Yorkshireman's pie at £2 a slice. Hotels, Pubs and Restaurants: Set in a rural area there are some good pubs and country hotels. Best of these is the Crosby Lodge Hotel east of the town or the North Lakes Hotel off junction 40 of the M6 and to the west on the A66 the Pheasant at Bassenthwaite. Pubs of note include the Duke's Head at Armathwaite and the Crown at Wetheral. By Road: Via the M6 J36, then the A590. By Rail: To Carke in Cartmel and Grange-Over-Sands. Admission: Paddock: £18 (over 60's £13). Course: £9 (over 60's £7). Under 16's free if accompanied by an adult. Cartmel is a unique rural course devoted to jumps racing. As you make your way through the village you come across it in the middle, complete with the village cricket square. The racing is not of the highest calibre but provides an unusual and rewarding day out. Staff are attentive and charming. The racecard is glossy, informative and only £1. There is usually pre-race entertainment such as terrier racing. Catering: Cartmel provides the perfect setting for a picnic and marquees provide seafood, champagne or a 3 course lunch. Hotels, Pubs and Restaurants: Cartmel boasts 2 fine country hotels Aynsome Manor and Uplands. The Old Vicarage at Witherslack, a short drive north, provides above average standards of accommodation, food and drink. The Cartmel restaurant L'Enclume provides expensive high class cuisine and pubs in the area include the 15th century Cavendish and the Masons Arms at Cartmel Fell. By Road: Via the A1, close to the junction of the A66 (Scotch Corner). By Rail: To Darlington or Northallerton then bus service. Admission: Club: £16, Tattersalls: £12, Course Enclosure: £3.50. Accompanied Children Under 16 Free. Not a particularly attractive course although easy to find and parking adequate when you get there. The staff could be more helpful and friendly and some of the facilities are antiquated. The stand offers decent shelter and affords a good view of the tight left handed track. The racecard is poor and the public address uninformative. Catering: The Paddock bar is pleasant and the dining room has character. The ambitious menu includes seafood bouillabaise (£7.15) and stuffed breast of lamb £6.95. The Club bar serves homemade giant Yorkshire puddings with a variety of fillings(£3.45) A good selection of champagnes are available (£22 to £42) and cigars are on display. Hotels, Pubs and Restaurants: Avoid Catterick and head for the Kings Head at Richmond or the White Swan at Middleham. However the best choice locally is the Blue Lion in the village of East Witton. Chelmsford City All Weather is a left handed Flat track with a polytrack surface and a circuit of 8.5f. Michael Bell who trains horses in nearby Newmarket says: "I sent some horses to work there in the summer and thought the surface was great." By Rail: To Chelmsford railway station from Liverpool Street station, London. The course is a 20 minute taxi drive from Chelmsford railway station. Catering: There are 2 restaurants - the Fairwood located on the ground floor offers a 2 and 3 course menu starting from £41 per person. The Club restaurant and lounge is located on the first floor of the grandstand with panoramic views of the racecourse with packages starting from £62 per person. This is an exclusive and VIP styled restaurant. Hotels, Pubs and Restaurants: Chelmsford City has been awarded a purple flag for safe and pleasant dining experience in town. There are over a 100 place to dine in town of which The Plough in Duke Street is one of the best. By Rail: To Cheltenham Spa then bus service. Admission: Club: £20, (16-24's £15, ID required). Tattersalls: £20. Best Mate: £8. Cheltenhaam racecourse, otherwise known as Prestbury Park, set in the rolling Cotswold hills, is one of the finest in the UK and affords gorgeous views across the valley to Cleeve Hill. Home to the Festival that ends the National Hunt season in March Cheltenham attracts vast crowds of jumps enthusiasts and the most talented horses. The facilities are top class and expansive enough to cope with the needs of the crowds. The car parks are capacious and well sign posted. The staff are efficient and keep the operation ticking like clockwork. The racecard at £2 is well designed, clear and helpful. News and interviews are broadcast over the public address and there are plenty of bookmakers. Catering: The panoramic restaurant beyond the winning post is one of the most impressive in Britain and there are many other good food outlets througout the course. Best place for a drink is the Arkle bar while the Golden Miller bar offers a temendous seafood counter. Hotels, Pubs and Restaurants: Cheltenham has a host of good hotels and restaurants. The Regency Montpellier has lively bars. Pubs close to the course include the Sudeley Arms in Portland Square. Some of the best pubs are found in nearby villages such as the Green Dragon at Cowley, Kilkenny Inn near Andoversford and the Bathurst Arms at North Cerney. Restaurants in town include the Champignon Sauvage, the Petit Blanc in Montpellier and the Cafe Paradiso in the Hotel Kandinsky. By Road: On the A446, near to the Severn Bridge. By Rail: To Chepstow station then bus service. Chepstow is a charming racecourse set in attractive surroundings. A Stan Clarke course, it bears his stamp of green paint, uniformd staff and a chattily informative racecard. The standard of racing is high and the catering and viewing facilities are good. Signs to the course are easy to follow and the car park is gravelled. Catering: The members restaurant is nondescript so head for the Persian War Bar beyond the winning post. Super sandwiches are a speciality at £4.10 and the bar offers 1/4 bottles of wine at £3.60 with a choice of champagnes. At the other end of the course the Tattersalls bar serves iced mineral water and white wine and leads in to the large betting ring. Hotels, Pubs and Restaurants: Decent establishments are thin on the ground, although the Marriott, St Pierre Park is imposing and offers leisure facilities. Or try the Castle View in Bridge Street or the Knot restaurant. For enchanting pubs and guest houses you will need to journey further up the Wye valley. Guide to Chester Left handed, circular course of 1m 73y, with a short run-in of 230y. Track is sharp but level and considered one of the specialist Racecourses. By Rail: To Chester General station then bus service. Admission: County Long Room : £36, Concourse: (ground floor access only) £27, Tattersalls & Paddock: £22. Accompanied children under 16 Free; Dee Stand £10; Open Course £7. Dress Code in County Enc: Gentlemen - suit or jacket with shirt & tie all racedays. Chester is a beguiling and atmospheric course, set in the middle of the town. Everything is shoe-horned into a small area and as a result the racing has an air of immediacy and excitement. The downside is the difficulty of reaching the course through the town on racedays, although there is ample car parking in the centre of the course. The weighing room, parade ring and winning enclosure are all in the centre together with a restaurant and a number of private tents. Catering: The Stand is attractive and plush where the Long Room on the first floor has a civilised bar. An excellent restaurant, in the County Stand, serves lunch at £25 a head. Hotels, Pubs and Restaurants: The city boasts a number of grand hotels such as the 5 star Chester Grosvenor but two miles out of town the village of Mollington has two fine hotels, the historic Crabwell Manor and the modern Mollington Banastre. Pubs include the Rising Sun at Taporley and the Grosvenor Arms at Aldford. Or try the unspoilt Victorian pub, the Albion in Parke Street. By Rail: Doncaster station, bus service runs to course. Admission: Premier: £35.County: £25; Grandstand £15, Family Enclosure £7. Accompanied under-16's free. Signs to the racecourse are good as are the car parks but the area is very industrialised. The staff are helpful and the racecards are adequate. Catering: Generally not up to much although this may have improved since refurbishment. For families the Silver Patriarch bar is clean and brightly decorated but it may be best to take a picnic. By Rail: To Epsom, Epsom Downs or Tattenham Corner. Admission: Queen's Stand £17 - £18, Grandstand £11 - £13, Derby prices set annually. The Queen's Stand at Epsom is the finest in the land and caters for the racegoers every whim. Lavishly produced racecards are sold in the foyer and nearby is a drinking water dispenser and free taxi pone. Climb a few steps to attractive bars and cafes with comfortable seating and balconies that overlook the winners enclosure and the course beyond. Signs to the course are good and taking J8 from the M25 avoids the bottleneck in the town centre. Catering: There is plenty of good food supplied, from mobile trolleys to the Blue Riband restaurant offering lunch at £37.50. Less expensive is the seafood bar or Cafe Normandie situated on the first floor of the old stand. Bars are plentiful but pricey. Hotels, Pubs and Restaurants: Good local hotels, pubs and restaurants are thin on the ground. Reasonable pubs include the Sir Douglas Haig and the Plough in Effingham and in Dorking the Burford Bridge Hotel. There is a Hilton in Cobham and also the grand and expensive Woodlands Park. By Road: On the A38, 2 miles east of Chudleigh. By Rail: To Exeter St Davids where there is a free bus service to the course; check times at the racecourse website. Admission: Haldon Stand: £18. Grandstand & Paddock: £13. Accompanied children under 16 Free. Set at the top of a hill on the edge of Dartmoor, the course affords glorious views of the surrounding countryside. However in winter it can be bleak and prone to fog which obscures the course. Signs are good and the free car parks hard surfaced. The racecard could be improved but the public address is informative and includes interviews with trainers. Catering: You can have a drink and place a bet in the William Hill Bar, while the Romany Bar serves good, inexpensive wine and beer. Hearty food is supplied by the University of Exeter. The Desert Orchid restaurant upstairs provides lunch for £18.50. Hotels, Pubs and Restaurants: One of the finest pubs in Britain, the Nobody Inn, can be found 2 miles from the course at Dunchideok. A cosy traditional pub with a fine menu and wine list. For accommodation try the Bel Alp at Haytor or for a special treat, Gidleigh Park at Chagford. In Exeter itself, St Olaves Court by the cathedral is good and Brass is a good restaurant. By Rail: Liverpool Street to Norwich, then taxi. Fakenham is an atmospheric jumps course set in rural Norfolk and only a few miles from the north Norfolk coast. Signs to the course are good and the car parking on grass is free and convenient. The racecard and public address are adequate. Prize money is good, encouraging certain powerful trainers and thus enhancing the quality of racing. Even the jockeys are encouraged by the provision of a full time physiotherapist. Bookmakers are spread throughout the various enclosures and there is an ancient viewing stand. Catering: There is a well appointed marquee serving lunches, good coffee, drinks and a hog roast. Dotted about are hot chestnut and cheese stalls and a small real ale tent serving Adnams ale from the barrel. By Rail: Westernhanger station is next to the course. The racecourse is akin to a place that Time forgot and is little changed since its creation as a jumps course in 1898. Car parking is in a series of small fields. The stand is made of white weatherboard and fading paint. Recently taken over by the Arena Group, things can only improve. The racecard is colourful and contains some enterprising offers, such as a private box for 10 with lunch at £42.95 per head. Catering: Lunch at the Lookout Restaurant is £21 or try ham, eggs and chips for £3 in the Paddock Cafe but avoid the Glover Bar. The betting area is small and there are not many places to view the racing. Best to head for the old stand and enjoy reasonable house wine in 25cl bottles for £3.60. Hotels, Pubs and Restaurants: The area has a neglected feel and good establishments are thin on the ground. The Clifton, high on the Leas has views or better still the Sandgate Hotel at Sandgate. For pubs try the Clarendon in Sandgate which serves decent food and wine. By Rail: From Victoria or London bridge to Barnham and then taxi or free coach to the course. Admission: (Standard Raceday) Premier enclosure £18, Grandstand and Paddock £13 (OAP’s/Students £9 I.D required). 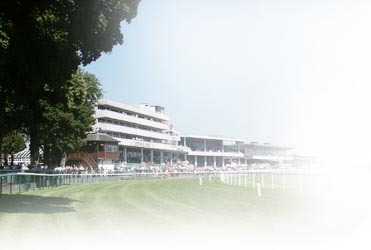 (Feature Raceday): £20; £15; £10. One of the best small tracks with bags of character. The hurdle course is just a mile round and encloses the figure of eight chase course in the middle. You can view the racing from the centre and experience the excitement of the leaping horses looming large. There are several small country buildings dotted about amid attractive gardens. It is easy to find but the car parks could do with upgrading. The racecard at £1.50 is colourful and informative and can be found in the shop and information desk. Catering: The salmon Spray bar serves Gales bitter from the barrel at £1.50 a pint and all the bars are well stocked and staffed. A three course meal is served in Fontwell House for £25 and two of the main bars have seafood areas while the other bar serves curries at £4 a time. The Lawn bar serves good coffee and well filled baps. Road: From the east: take Junction 48 (M4) joining the A4138 to Llanelli and follow brown signs; From the west � follow A40 to Carmarthen, then A484 to Llanelli and follow brown signs; From Cross Hands � take A476 towards Llanelli and follow brown signs Rail: Llanelli (9 miles), Kidwelly (5 miles), Carmarthen (15 miles) Air: Helicopter landing facilities, by arrangement. Bus: First Cymru (Mon-Sat) bus service from Llanelli to Carmarthen (No 197); drop-off at racecourse entrance. This is a brand new track created in breathtaking Carmarthenshire countryside on the site of an old welsh opencast mine. 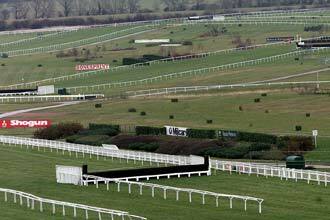 It stages both flat and National Hunt fixtures on a flat well drained track. By Rail: To Chichester with a bus service on racedays. Admission: Richmond Enclosure: £24. Gordon Enclosure: £17, over 65's £12. Lennox Enclosure: CLOSED. Accompanied under-17s free, ID required. In fine weather, Goodwood is indeed glorious. Set amid the Sussex Downs, it forms part of a number of attractions including motor racing, a museum and a golf course. Unusually the free entry age limit is 17. Signs to the course are good and the car parks excellent, though not all are free. The course and toilets are kept clean and tidy and a dress code applies only to the Richmond enclosure (no jeans, hot pants or bare midriffs). The racecard is good value and there is a continuously updated noticeboard. Catering: Drinks can be expensive with a 1/4 bottle of wine costing £4. The food in the Richmond and less expensive Gordon enclosures is interesting and there is a burger and pizza bar in the Front Runner enclosure. The stands are comfortable and afford great views across the Downs. Hotels, Pubs and Restaurants: For the July meeting everyone raises their prices and tend to get booked up months in advance. At other times there is a good choice, the nearest being the high class Marriott, Goodwood Park. The Millstream Hotel is in the nearby village of Bosham, while the Spencers and 36 On The Quay are decent restaurants at Emsworth. Or try the Angel Hotel at Midhurst. Friendly pubs include the Fox Goes Free at Singleton and the White Horse at Chilgrove. By Road: The course is on the B7071 Bothwell road, Hamilton and can be reached from J5 of the M74. By Rail: To Hamilton West near the course. Admission: Premier days: Club: £20. Grandstand: £15. Themed days: One enclosure, £13. Accompanied children under 16 Free. OAP's: £4 deduction, ID required. Hamilton is a well maintained and attractive course. It is easy to find and the car parks are good with friendly welcoming staff. The racecard needs improving and the winning enclosure is cramped. The toilets are clean and well maintained. Catering: The main stand is attractive and well designed with a viewing restaurant, a cafe and bar. There are good bars in the Dukes Room and Joe Punters serving champagne by the glass and reasonably priced wine. Hotels, Pubs and Restaurants: The nearest hotel is the 3 star Bothwell Bridge, otherwise head for Glasgow, 10 miles distant, to the Malmaison or One Devonshire Gardens. There are good pubs and restaurants aplenty in town. By Road: Via the M6, J23 and the A49. Admission: Premier £30 - £35, County Stand £17 - £21, Tattersalls £10 - £13, Newton £5 - £6. 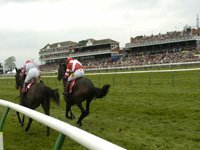 Haydock is a racecourse that manages to stage both jumps and flat racing equally well. Signs and access to the course are good and the car parks are free and well ordered. You are met by smiling staff at the smart reception area and the course is attractive with benches scattered under the trees. The racecard is colourful and good value for £2, while closed circuit TV broadcasts race previews and interviews. Catering: The bars are comfortable and the beer and wine inexpensive. For £35 you can enjoy the facilities of the Premier area, which includes Harry's Bistro and a balcony with great views of the racing. The Newton enclosure is suitable for families and includes a children's playground and picnic areas. Hotels, Pubs and Restaurants: There are few good pubs in this area but the hotels are reasonable including The Thistle and Daresbury Park complete with leisure facilities. For good restaurants make a detour to Manchester. By Road: Via the A40 and A49 from the south or M5, M50 and A49 from the north. By Rail: To Hereford station then taxi. Admission: One Enclosure: £16 (OAP's (with OAP club card) and students £14, ID required). Accompanied U-16's: Free. The racecourse is not the easiest to find and the car park could be better organised. Viewing from the stands and lawns is good but the paddock and winning enclosure are poor. Catering: The bars are comfortable and the beer, wine and local cider inexpensive. Dining in the Club House is good and it is possible to reserve tables with a view of the racing. The Tattersalls buffet, serving pasties and saugage rolls, less so. Hotels, Pubs and Restaurants: The Castle House Hotel in Hereford is excellent and there are plenty of fine pubs including the Ancient Camp at Ruckhall, selling Hook Norton ale and fine food, The Lough Pool at Sellack, the Butchers Arms and the Crown at Woolhope. By Rail: To Hexham station then taxi. Unfortunately its very remoteness is its downfall resulting in small crowds and poor racing. The Ranshaw stand is modern but fails to inspire and improvements could be made to the signs and car parks. The racecard is cheap and cheerful. Catering: The Ranshaw stand has an upstairs carvery and the Brambles Tudor bar serves fresh rolls, pies and peas. While the Pavilion restaurant resembles a tearoom the Shire bar is best avoided. Admission: One enclosure: £15. Picnic: £7. Accompanied U-16's free. Jubilee membership (OAP) £10 joining fee & subsequent £5 off badge. Huntingdon is a compact course set near the busy A1 and overflown by jets from the nearby RAF stations. However it does have much to recommend it including attractive scenery, easy access, informative racecard and comfortable bars. The car parks can become boggy during wet weather, while the parade ring is narrow and the winning enclosure small. Catering: Just to the left of the entrance is the Seafood and Champagne Bar serving good value food. In the Peterborough Bar you can splash out on a table for the day which includes the entrance fee. There is a plethora of small outlets selling pizza, baguettes, baked potatoes and a hog roast. The new bars are excellent and cater for the needs of the racegoer by providing a good view of the racing. Hotels, Pubs and Restaurants: The Old Bridge in town is a fine Inn with a good restaurant or try the Three Horseshoes at Madingley. A little further out is the pleasant Pheasant at Keyston, serving exceptional food. The Old Ferry Boat is a charming pub with accommodation or nearer to hand is the Stukeleys Country Hotel. Admission: Members: (weekends) £20, (midweek) £16. Tattersalls & Paddock £12; Students & OAPs (identification required) £8. Accompanied U-16's free. Kelso is one of the remotest tracks and although there is little in the way of finesse or creature comforts, it is deservedly popular. The car park can become boggy and the racecard is ordinary but useful and informative. Commended as an attraction by the Scottish Tourist board it is a friendly course and has a relaxed atmosphere. Catering: A typical Scottish meal of haggis, tatties and neeps is a treat at Rosie's Bistro. There is a primitive al fresco bar known as the Chicken Hutch and marginally better is the Tattersalls Bar serving beer and whiskey. The members bar is more snug where pasties and decent coffee are available. Hotels, Pubs and Restaurants: Ednam House, near the town square is comfortable while just out of town the Roxburghe is a quality hotel with sporting facilities. For a local pub try the Queen's Head in Bridge Street. 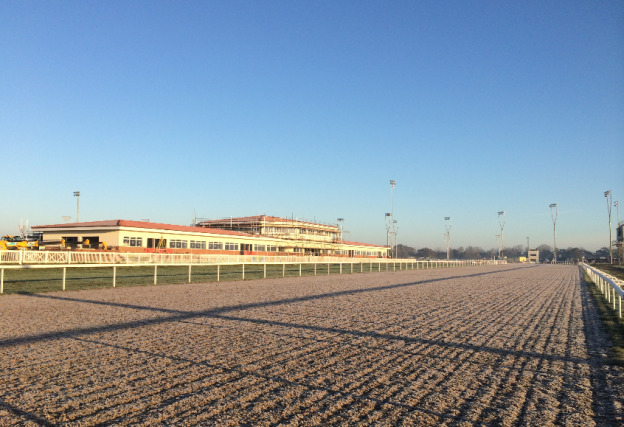 Racecourses guide to Kempton Kempton now boasts an all weather track in addition to the existing Jumps track. Right-handed,sharp,1m 5f, run-in of three and a half furlongs. Also the 1m 2f Jubilee and a straight 6f course. NH course is flat, 1m 5f (10) 175y run-in. Emphasis on both jumping and speed. Low numbers hold a significant advantage in sprints when the stalls are on the stands side and the going is soft. When the stalls are on the far side, high numbers seem best - Tight. The home straight of new Jump course has been moved closer to the grandstand bringing the racing action closer than ever before. This has increased the Jump racing surface by 10m which will help provide fresh ground for each fixture. The overall increase in turf for Jump racing is 33%. Admission: All enclosures: £15. Accompanied U-16's free. Diamond club members £5 off. Students half price; ID required. Kempton considers itself the London racecourse and although access from the M3 is unappealing it does have the benefit of the Thames running behind. The car parks are spacious and well organised by polite staff. The racecard is excellent value and the public address updates the crowd throughout the afternoon. The betting ring is bright and modern with a Tote shop, big screen and even spread betting screens in the Sporting Index Bar where you can enjoy a selection of fine wines. Catering: The White Horse in the Silver Ring is like dropping in to your local for a drink and serves good, inexpensive hand drawn beers from the barrel. The public areas in the Premier enclosure are stylish and comfortable with a good bistro and a two tier viewing restaurant. Hotels, Pubs and Restaurants: Head left out of the racecourse gate along the Thames towards Hampton Court where attractive pubs include the King's Arms or try the Carlton Mitre Hotel for accommodation. Admission: Club Room: £25, Belvoir Stand £19, Grandstand £15 (concession for senior citizens and students (card holders) - Club & Tattersalls £12); Picnic Car Park open, weather permitting. Accompanied children under 16 Free. Leicester is a pleasant and comfortable racecourse, more appreciated by trainers and owners than the paying public if attendances are anything to go by. The car parks are efficient and the uniformed staff friendly with an area near the entrance for disabled users. The racecard is basic but unusually, free. The betting area is spacious and there are Tote outlets and TV screens aplenty. Catering: The Quorn Room is a bright cafe serving homely food and good coffee. Admission: (Summer weekends & evenings) Premier: £25. Grandstand: £18. (Summer weekday) £20 & £15. (winter weekday, one enclosure) £15, (weekend) £18. National Hunt £20, £15. Accompanied U-16's free. Mainly all weather racing but also flat racing on turf and a couple of days of jumps racing. Owned by Arena Leisure, Lingfield is mainly a gambling racecourse, providing 2 days of all weather racing a week for the benefit of betting shops. Attendances are low but everyone does their best to make your visit an enjoyable one. The car parks are capacious and mostly gravel. The racecard is basic and there is little in the way of lively public address or winners enclosure celebrations. Catering: The Derby Bar serves all day breakfast and the brasserie hot pork baguettes while the trackside carvery serves lunch with a view of the racing. Hotels, Pubs and Restaurants: This is a green and pleasant land exemplified by the 16th century Gravetye Manor hotel, set in 1,000 acres of woodland, near East Grinstead. Local pubs include the Hare And Hounds in Lingfield and the Blue Anchor in Blindley Heath. Further out at South Godstone is the Fox And Hounds serving real ale and good food. Admission: Club: £18, Grandstand/Paddock £14 (£2 refreshment voucher for Senior Citizens), Course £8. Ludlow is P. G. Wodehouse country complete with Blandings Castle. This is essentially rural England at its finest and Ludlow racecourse is steeped in history, having hosted racing here for nigh on 300 years. Clee Hill provides a dramatic backcloth to the course but it does have the drawback of finding itself cramped for space, partiularly as development is inhibited by the proximity of the railway line running beside the rear of the stand. The access road and car park suffer from this limitation but the visitor is well rewarded by the attractive scenery and Ludlow itself is well worth the visit. The racecard and public address need more sparkle while the layout of the course is complicated in having the paddock, winners enclosure and weighing room situated within the track. To save time, the bookmakers are postioned between the paddock and the course crossing and a good view can be had from the top of the antique grandstand. Catering: The Clive Pavilion has a comfortable bar and a cheap snack bar, but the restaurant has no view of the racing. Hotels, Pubs and Restaurants: There are many good restaurants and pubs in town, the best of which is the Merchant House Restaurant in Lower Corve Street and the Unicorn next door or try the more modern Hibiscus restaurant. For accommodation try the Overton Grange Hotel or Dinham Hall. Well worth considering are The Roebuck at Brimfield or the Crown at Hopton Wafers on the Kidderminster road. Admission: Premier Members: £22. County Enclosure: £18. (16-21 yrs/NUS card £13, ID required). Tattersalls £13. Family Enclosure £8. Accompanied Children Under 16 Free; discounts only available to OAPs who are Jubilee Club members. 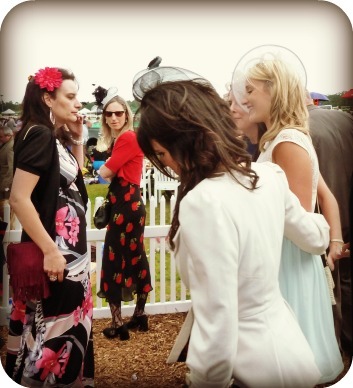 Market Rasen racecourse is a firm favourite with racegoers as it goes out of its way to over deliver to its customers. Providing entertainment such as terrier racing and laser shooting even in the Silver ring. There is plenty of room even on busy weekends and there is a picnic area and views of the racing from the car parks. There is little traffic on the roads and the course is well sign posted and easily found. Racecards are well designed and informative. The betting ring is well positioned and the course and parade ring can be viewed from almost anywhere. Catering: The members bar serves good, inexpensive food and decent coffee. Hotels, Pubs and Restaurants: Not much in the immediate vicinity of the racecourse but the Cider Centre 6 miles distant at Brandy Wharf is worth a visit. The Lines Hotel in Market Rasen is reasonable or to the north, Winteringham Fields near the Humber Bridge is excellent, while to the east of Lincoln, Washingborough Hall is friendly and serves good food. Admission: Club enclosure & Grandstand; £15, OAP's £8. Accompanied under-16s Free. When Musselburgh gets a bashing from the elements the course can be a grim place especially as the car parks are grass covered. But if the sun shines, the course is transformed by the attractive scenery. The racecard is informative and the public address enterprising with interviews for trainers and jockeys. Catering: Pinkies Bar is interesting, decorated with racing memorabilia and a line of TV screens. The beer and food are good and a few tables near the window may be booked for lunch. Hotels, Pubs and Restaurants: The course is set on the outskirts of Edinburgh with a georgeous coastline to the east. Edinburgh has many good restaurants, headed by Restaurant Martin Wishart on the Leith waterfront. Hotels abound and worth mentioning are the Marriott, Malmaison, Swallow and the most attractive, Holyrood House. Outside the city Houstonn House at Upall is handy for the airport or try Roslin Glen, Greywalls or Golf Inn at Gullame. Best pubs are the Tweeddale Arms at Gifford and the Waterside at Haddington. Had a great day at the Racecourse? Why not share it with readers - it couldn't be easier!